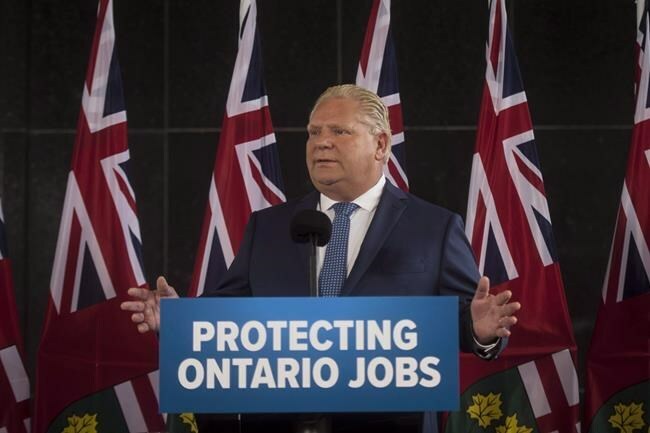 TORONTO — Ontario's incoming premier has put the public service under a hiring freeze as part of a series of measures meant to limit spending as he re-examines the province's books, raising concerns among some government workers. A spokesman for Doug Ford said the Progressive Conservative leader has also directed government ministries to cancel "subscription-based services" and to restrict out-of-province travel. "The people of Ontario work hard for their money and they expect their tax dollars to go to the services we all depend on," Simon Jefferies said in a statement. "We are also going to go line by line through the government's books to ensure value of money for the people of Ontario's tax dollars." "Any planned expenditures that are not committed by contract and/or required to meet immediate legal obligations or address matters of health and safety are to be deferred pending further direction," it said. "In cases where work is in progress, an assessment should be undertaken and available options exercised as appropriate to slow and/or temporarily stop activities until further direction is received." Ford's office did not immediately respond when asked how much money the new measures were expected to save. The head of the Ontario Public Service Employees Union said he's not surprised by the decision to suspend hiring, but has concerns about how it may affect services and the 34,000 public sector workers the union represents. OPSEU's president, Warren "Smokey" Thomas, said his phone was lighting up Monday with calls from worried members. "People want to know, 'Am I going to get laid off? Am I still going to be doing the work of three people because my unit's been short...two people?'" he said. "They're just worried about being able to do their job." "You have people who retire, people who get new jobs, people who leave," he said. "That all impacts frontline services. When you got to a Service Ontario counter and if two people there have retired and they don't replace them, well, that's less frontline service." Peter Graefe, a political science professor at Hamilton's McMaster University, said Monday's announcement is a fairly effective strategy to make it seem "like you're doing something even when it's kind of clear that it's not really that well thought through yet." "A hiring freeze is kind of a classic way of saying you're going to be saving money by shrinking the size of the public sector...but it's also a way of saying that you actually don't have priorities because places are going to shrink or grow simply based on where people retire or leave for other places," he said. "The suggestions will be, 'well these are things that the public sector shouldn't be doing,' which again is fine, but that's not about waste, that's about making decisions about what should be public and what should be private."